Many writers think when a content editor (development or line) is done with their manuscript, it’s ready to print! Not so fast. The next step is to get the manuscript to a copy editor. What does a copy editor do? Well, all the things your grandfather thinks an “editor” does: grammar, punctuation, spelling, fact-checking, consistency, trademark checking, reference confirming, and most importantly, style conforming. Confused yet? 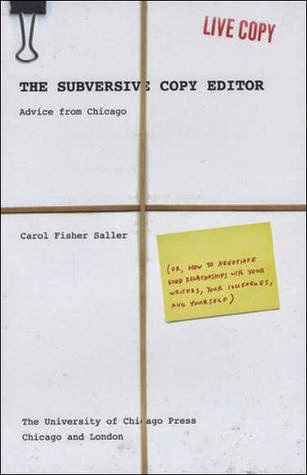 If you want to know exactly what a copy editor does (and does not), and if you want some tips for how to work well with one, The Subversive Copy Editor: Advice from Chicago, is an excellent place to start. The author is the editor of The Chicago Manual of Style’s online Q&A. The Chicago Manual of Style is the bible for all style questions in the book publishing world. It answers all sorts of questions, such as whether or not to use the serial comma (yes), whether to put a comma before Jr. (no), and whether to capitalize job titles (no, unless it’s trademarked or the President). For writers, the key chapters are the ones on “Working for the Reader” and “When Things Get Tough: The Difficult Author.” No one wants to be difficult, and if authors better understand where editors are is coming from, it’s a lot easier to take criticism, especially when well-intentioned. Carol Fisher Saller is also easy to take advice from because she is not a strict grammarian (she advises adhering to the style manual, except “when it’s not working for you.”) She likes to do things within reason and only if they make sense. She’s willing to work with an author’s own quirky style so long as it’s internally consistent, understandable, and not ugly. Her primary goal is to be sure the reader will understand what she is reading, without confusion or misdirection. If you think you might want to be a copyeditor, or if you already work in some area of production, this book is a must read. Ms. Saller's advice is invaluable and, luckily, humorous. If you don’t want to have a heated battle over comma placement, first remember you must know the rules before you can break the rules. And reading this book, one of the rulebooks for the rule keepers, is a good step in that direction.